As an owner of a bicycle, you know the importance of keeping your bicycle clean and well-maintained, and its effect on overall performance. As a newbie to the world of bicycling, the very same can raise questions about the total cost incurred to keep your bicycle well-maintained, on a regular basis. To address this very issue, Muc Off has a three step program, with products designed to make maintaining your bicycle a piece of cake. Read on to find out more. Muc Off has products designed to clean your bicycle from top to bottom, effortlessly. 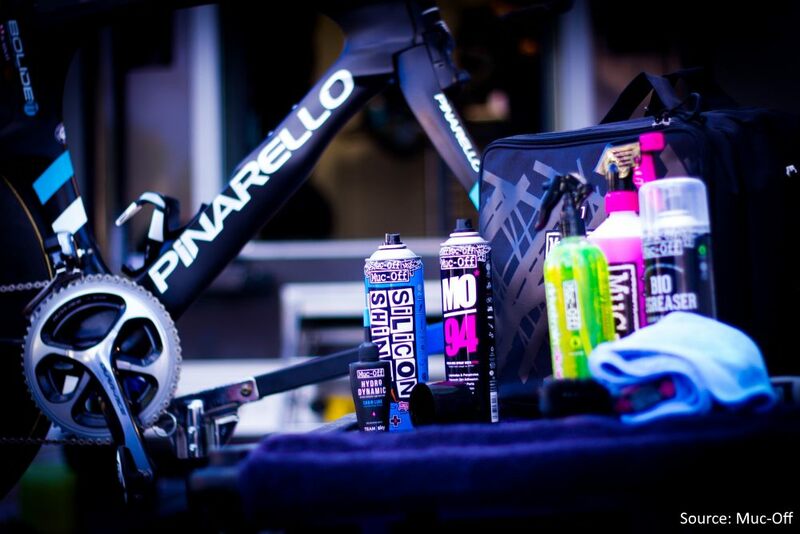 These products include the Muc Off Drivetrain Cleaner, X-3 Dirty Chain Machine, Nano Tech Bike Cleaner, Brushes and a Brake Cleaner for disc brakes. This step requires that you spray the drivetrain cleaner onto the chain and cogs and then use the chain cleaner to get the grease of them. Then you need to wet your bicycle and coat it with the nano tech bike cleaner while making sure that the bicycle is out of direct sunlight. Apply and agitate the cleaner onto the areas that catch dirt such like the underside of the frame, between the frame and the wheels etc. using the brushes. Leave the cleaner on for up to 5 minutes and then rinse it off from your bicycle using water. The last thing in this stage is to clean the brakes using the brake cleaner, and while doing so ensure that you completely clean the brake pads, brakes and wipe away extra residue. Now that the bicycle is clean, the next step would be to protect the bicycle and the components on the bicycle for your next ride. 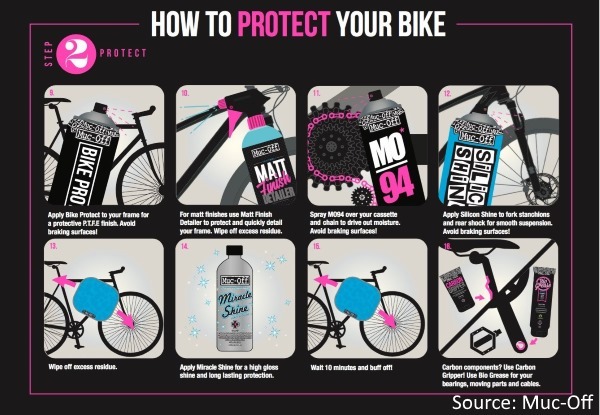 To do this, the products recommended would be the Muc Off Bike Protect, Muc Off Matte Finish Detailer which is applied to the frame of the bicycle. The former for regular painted frames and the latter for frames with a matte finish. Next, the MO94 which is sprayed onto the cassette and the chain to drive out moisture. The Muc Off Silicone Shine is to be applied onto the suspension fork(s) for smoother suspension. Additionally, the Muc Off Miracle Shine can be used for that added glossiness to your bicycle’s frame and for long lasting protection. 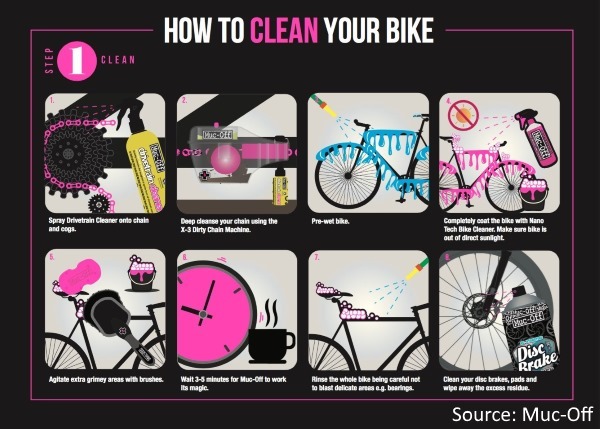 It is important to remember to wipe off all excess residue of products used on your bicycle. There is nothing better than a clean, well-oiled machine - and why should it be any different when it comes to bicycles? That’s right, the third step is to keep your bicycle oiled a.k.a well-lubed for a smooth and slick ride. Given that there are variants of lube available, namely wet lube and dry lube, a common doubt that arises is which to use. 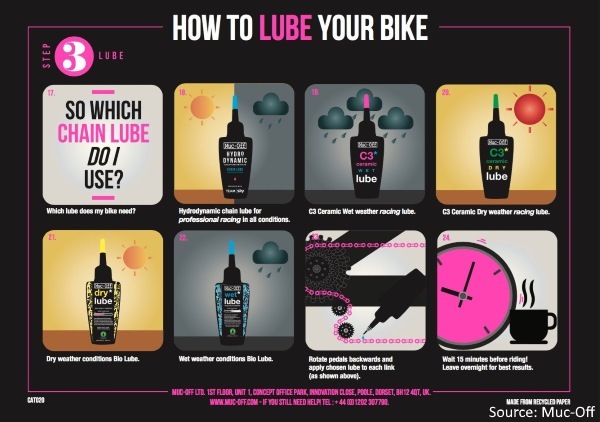 The lube used is based on the conditions you are going to be riding in. If riding in wet conditions, wet lube is ideal as it has waterproof qualities. If riding in dry/ dusty conditions, dry lube is the way to go. To lube your chain, rotate pedals backwards while applying the chosen lube to every chain link. It is imperative to do this at least 15 minutes prior to your ride, however lubing your chain a night prior to riding is ideal for best results. While riding a bicycle is a fun activity, the thought of cleaning it can be daunting. However, there is no harm giving it a try and coming to realize that cleaning your bicycle can be a fun weekend activity, too. Furthermore, with the development of the bicycle and allied industries, these amazing products in the market make cleaning your bicycle a walk in the park, and can also be a great way to save money. Check out the range of Muc Off Bicycle Maintenance Accessories here.